From the late 1800s, when Utah became a state, to World War II, Mormonism and The Church of Jesus Christ of Latter-day Saints (Mormon Church) moved from being an isolated church in Utah to gaining respect from mainstream American society, and becoming more integrated into the country’s culture. Mormonism also grew outside the U.S., especially in Mexico, Canada, and England, while many thousands joined the Church in Germany. Mormon missionary work began in Japan and Korea as well. This period also saw much consolidation in Mormon practice and organization. Many organizations of the Church were streamlined and regularized in preparation for the explosive growth of the Church in the latter half of the twentieth century. By the end of this period, just after World War II, The Church of Jesus Christ of Latter-day Saints was set to become an international Church. Following statehood, which put many restrictions on the Mormon Church, Utah-based political parties were abandoned, especially the Church-endorsed People’s Party, and most Mormons became Democrats, since the Republican Party had been the driving force behind much of the persecution in the 1880s. Due to fears of government intervention if Mormons appeared to vote solely in blocks, some Church leaders, including Mormon Apostle Joseph F. Smith, encouraged Mormons to consider both parties. Joseph F. Smith even outlined reasons why Mormons should consider becoming Republicans. As part of this effort to show their loyalty to the U.S., the Mormon Church issued a statement supporting the United States against Spain in the Spanish-American War in 1898. This period also saw many firsts. In November of 1896, President Wilford Woodruff directed that the first Sunday of every month be set aside for fasting. Fast Sunday, as Mormons call it, is still practiced. On that day, Mormons abstain from eating and drinking anything for twenty-four hours and give offerings to help the poor. Initially these offerings were in kind, such as chickens, milk, eggs, or clothing. By the early 1900s, in-kind contributions were discontinued. In 1897, the Improvement Era magazine was begun, which was renamed the Ensign Magazine in the 1970s, and continues as the official magazine of the Mormon Church. The first single, female missionaries were sent out in 1898. 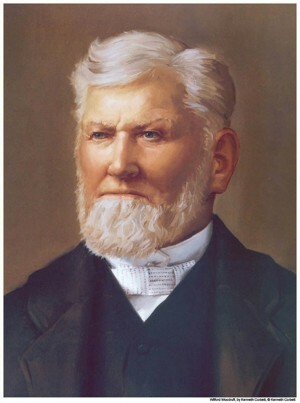 President Wilford Woodruff died in 1898, and Lorenzo Snow became president and prophet to the Mormon Church soon after. In October of 1898, President Snow issued bonds to help get the Church out of the debt caused by the intense persecution of 1870s and 1880s. In May of 1899, while traveling to drought-stricken St. George, Utah, President Snow received a revelation that the members of the Church were not paying a full tithing, that is, a tenth of their annual income, as the Lord had commanded. He promised them that if they would pay, the rains would return and the Church would get out of debt. Within months, the amount of tithing being paid doubled and, sure enough, the rains came. In 1907, the Mormon Church officially emerged from its indebtedness. The twentieth century dawned with 271,681 members, located mostly in a belt from northern Mexico to southern Canada. Mormon missionary work continued, and Lorenzo Snow directed missionaries to proselyte in Japan in 1901. President Snow also reissued the Manifesto ending the practice of polygamy, since some members of the Church, especially those not in the United States, believed that it did not apply to them. President Snow died on October 10, 1901. Joseph F. Smith, nephew to the Prophet Joseph Smith, became Church president in 1901. He was the first Mormon president born a Mormon and the last to have met Joseph Smith. He and his successor, Heber J. Grant, oversaw a period of increasing national presence and respect, though still coupled with many challenges. They also oversaw the purchase and preservation of many important historical sites. Problems continued with the Federal Government, and many Mormons found it difficult to obtain public office. In 1898, B. H. Roberts of the Quorum of the Seventy, had been elected to the U.S. House of Representatives, but the Congress banned him from taking his seat. In 1903, Reed Smoot, an Apostle, was elected to the U.S. Senate. His election started a two year trial, as he attempted to take his seat. Ultimately, most Mormon Church leaders were subpoenaed to appear before Congress. President Joseph F. Smith was questioned at length. At issue was the continuation of the practice of polygamy by some Mormons, and fears that Reed Smoot would not adequately separate his religious and political obligations. Theodore Roosevelt himself came to the aid of Smoot, who was a Republican. In 1904, President Smith issued a second Manifesto, forbidding polygamy Church-wide. This caused two Mormon Apostles, John W. Taylor and Matthais F. Cowley to resign from being Apostles. Taylor was excommunicated from the Church after he again entered into a polygamous marriage. Although regretable, the resignation of these two apostles showed the government that the Church was serious about ending the practice of polygamy. Ultimately, Smoot took his seat and served in the U.S. Senate admirably for nearly thirty years. Under Joseph F. Smith, the Mormon Church established new magazines like the Church News and The Children’s Friend which continue today. He also oversaw two hospitals built by the Church, LDS Hospital and Primary Children’s Hospital, both in Salt Lake City. In 1903, the Brigham Young Academy officially became Brigham Young University, the most famous Mormon Church college, though the Mormon Church also runs colleges in Utah, Idaho, Hawaii, and New Zealand, as well as many other secondary schools in the Pacific Islands and Mexico. Ultimately, the Church divested itself of most of these institutions, except for BYU and its satellite schools in Hawaii and Idaho, as well as a few secondary schools in Mexico and the Pacific Islands. Joseph F. Smith is known for his many profound doctrinal teachings. He issued declarations on the origin of mankind, the nature of the Godhead, the role of Jesus Christ, and others. He was a huge advocate for education, and in 1912 the seminary program began in Salt Lake City. The program provided weekday religious education for Mormon teenagers and still continues today. He also oversaw the Church’s adoption of the Boy Scout program, a partnership which has continued ever since. In 1913, he broke ground for the first Mormon temple outside the United States, in Alberta, Canada. In 1915, he broke ground for the first Hawaiin temple. Shortly before he died, he had a vision of the salvation of the dead and the importance of temple work. It later was included in the Doctrine and Covenants as section 138. He died in November. Because of the Spanish Flu epidemic, his funeral was not open to the public, and most large church meetings were canceled for the next few months. Mormon prophet born after the Mormon exodus to Utah. He became president in November 1918. His presidency saw the growth of the Church throughout the United States, and, during his years, many Mormons rose to prominence in America. This helped dispel many myths and rumors about the Church. His popularity as a speaker, even among non-Mormons, led him to speak nationwide in many diverse forums supporting moral and political causes. He dedicated the Hawaii Temple in 1919, and the Alberta, Canada temple in 1923, marking the growth of the Church outside of Utah. In 1920, President Grant, a strong health advocate, re-emphasized the importance of the Word of Wisdom, which many Mormons had become lax in following. He also campaigned vigorously for prohibition. In 1922, the Mormon Church helped start KZN, now KSL radio, and President Grant was one of the first to speak on this, the first radio station in the Intermountain West. In 1928 the Mormon Tabernacle Choir began its award-winning radio program Music and the Spoken Word, which has since become the longest running broadcast in radio history. President Grant was known for his concern for others and for preaching a gospel of love. He therefore reinstituted the Home Teaching program, in which companionships of two men visit the members of each congregation in their homes to teach them the gospel and render assistance. Home Teachers, as they are called, have become an important aspect of Mormon life. In 1925, President Grant established the Mission Home, the forerunner to the Missionary Training Centers, usually called MTCs by Mormons. The following year, 1926, the Church started its Institute of Religion program, which provides religious education for college-age Mormons. This Institute program, coupled with the seminary program discussed above, grew as the Mormon Church divested itself of many of its secondary schools and even its universities, turning them over to federal and state governments. President Grant also encouraged Mormons to spend time with their families. This led to what Mormons call Family Home Evening, for which Mormon families set aside one night each week, usually Mondays, to study the Gospel, participate in family activities, or just be with each other. Like everywhere else in the world, the Great Depression adversely affected Utah. A few years into the Depression, Harold B. Lee, a future president of the Church, began a program to provide employment and assistance for the Mormons in Salt Lake City. The Mormon Church then instituted this program Church-wide in 1936 as the Church Security Program, later called the Welfare Program. This program helped thousands of families support themselves during the Great Depression and continues to help many today. The principles of the Mormon Welfare Program–independence, hard work, and building a foundation for the future–underlie all Mormon welfare and humanitarian efforts. World events continued to affect the Church, especially as it grew abroad. 11,000 people joined the Mormon Church in Germany alone during the 1920s. The Church organized its first stakes (analogous to diocese) outside Utah in the 1920s. The Hill Cumorah Pageant was staged for the first time in 1937 and still attracts thousands of visitors each year to the place where the Book of Mormon was unearthed and translated. Many historical sites were purchased and visitors’ centers, similar to the one at Temple Square, were begun. However, events in Europe forced the Church to withdraw its missionaries from most countries in August of 1939, just one week before Hitler invaded Poland. During World War II, Mormons found themselves on opposing sides. By this time, the Mormon Church was established in nearly all the participating countries, Allied and Axis. President Grant issued a statement in 1942, saying that the responsibility for the war rested with the leaders of the countries and that while Mormons were opposed to war, they also supported the law and thus Mormons could be part of the military. To help Mormons in the military, the Church appointed Hugh B. Brown, a Canadian lawyer, to be a liaison for Mormon soldiers. The Church also published special, smaller copies of the Book of Mormon and the New Testament, which allowed soldiers to carry the scriptures with them during the war. Still, many Mormons in Europe struggled. In Germany, Mormons walked a fine line, and while they were never targeted for overt persecution like Jews or Jehovah’s Witnesses, their meetings were watched. Three Mormon boys, led by Helmuth Hübener, spread anti-Nazi propaganda. Hübener was eventually caught and executed, becoming the youngest person sentenced to death and executed by the Nazis outside the death camps. His two friends were sent to prison camps. Other Mormons, afraid for their lives, cut off ties with Hübener and his friends, though he has since come to be honored as a national hero in Germany. Much criticism has been laid against Mormon leaders in Germany both for not resisting the Nazis more and for cutting off connections with Hübener after his arrest. It was, however, a very difficult time with people afraid for their lives and torn by conflicting loyalties. Any judgment or criticism should be withheld. In the U.S., evidence of the Church’s broad acceptance was shown by the U.S. Navy’s commissioning of two ships, the U.S.S. Joseph Smith and the U.S.S. Brigham Young. Eventually, the war ended, but not before devastating Europe. However, the man who led the Mormon Church from obscurity and persecution to more general acceptance did not live to see its end. On May 14, 1945, Heber J. Grant died. During President Grant’s ministry and the ministry of Joseph F. Smith, many Mormons rose to prominence, and their good examples helped open doors for the Church. The first was Reed Smoot, whose career as a Senator won him many honors. Others, like Edgar B. Brossard and J. Reuben Clark, Jr., served in high government positions. Clark eventually became U.S. Ambassador to Mexico. Richard W. Young became a general during World War I, as well as serving as commissioner of the Philippines. Mormon soldiers often shared the gospel with their fellow soldiers and even the citizens of the countries they were fighting. This led to the Church being established in Japan, the Philippines, and Korea, where hundred of thousands of Mormons now live. Just after World War II, the new Mormon president, George Albert Smith, approached U.S. President Harry Truman and provided tens of thousands of pounds of clothes, blankets, and food for European reconstruction. He and Ezra Taft Benson, who later served as Secretary of Agriculture to President Eisenhower, and then as President of the Church, toured Europe, distributing over 90 train car loads of food and clothing to the people of Europe. They also contacted Mormons who had been cut off during the war. After the war, Mormonism began to spread rapidly throughout the entire world and the Mormon Church became an international church.